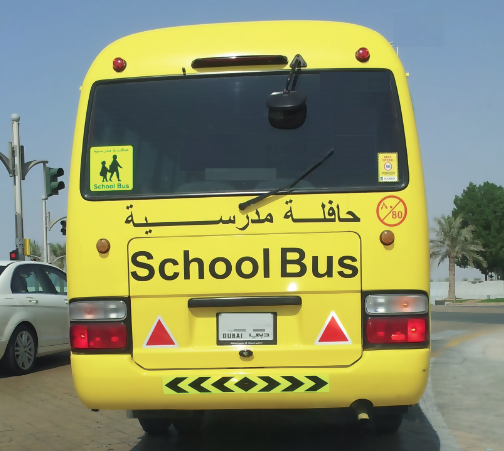 The yellow school bus is a common sight in Dubai ferrying children to and from school. Big and small, all working to a strict timetable. Arriving in Dubai and travelling along the Sheikh Zayed Road on the way to or from work you will notice the yellow school bus – lots of them! Eventually, the bright yellow school bus isn’t such a surprise to you. It is an extremely important part of school life in Dubai and the logistics involved are quite incredible really – considering that each child which uses the service is dropped off and collected from their front door (in most cases). Parents can choose to use the school bus service or drive the children to and from school. Sometimes the parents use the bus service only one way – whatever suits them better. Parking at all schools can be rather difficult because so many parents prefer to meet their child at the school. The school bus service organises a timetable for the pick up and delivery times depending on the location of the school and on the home of the child. The school bus service will drop the child/children off at the door of the child/children’s home. When visiting the school ensure you ask the question about the length of time the journey will take. Some children are on the bus for 40 minutes in the morning and 40 minutes in the afternoon so it is best to check this. The cost is approximately the same for most school bus services. Some schools run their own bus service otherwise school bus services are used. There is usually a driver (male) and a onboard female assistant to ensure the children’s safety. The school bus service speed limit is 80 kph. Further details will follow shortly regarding the bus service companies and the regulations to which they must adhere.